Prosecutor Matan Akiva argues with Leifer's defence lawyers Yehuda Fried and Adi Niv in court (photo: Nathan Jeffay). ​Former Adass Israel head teacher Malka Leifer has been enjoying a taste of freedom this week, as her alleged victims come to terms with the knowledge that she’s unlikely to face extradition proceedings any time soon. Israeli state prosecutors made a last-ditch attempt on Tuesday to convince the courts to keep her under house arrest – appealing to Judge Ram Vinograd to factor Israel-Australia relations into his decision. But the request fell on deaf ears and, in the second bombshell of the case in six days, the judge made it clear that there’s no room for appeal, and despite the fact that 74 charges of indecent acts committed against students wait for her in Victoria, she can live as a free woman in Israel with no immediate threat of extradition. 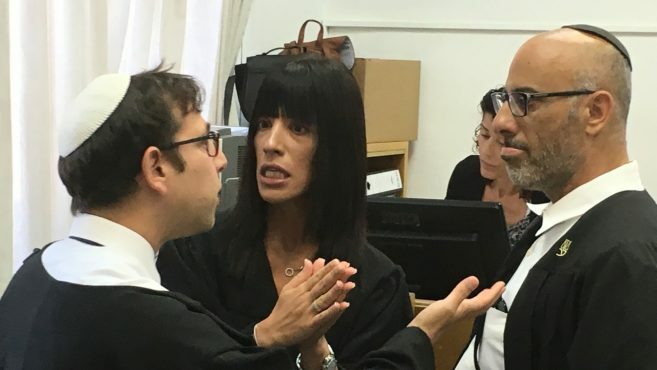 Last Thursday, Judge Amnon Cohen decided Leifer is too mentally unstable to face extradition proceedings, and shocked alleged victims and activists by deciding that, instead of going to hospital until she can face proceedings, she can live a normal life and just go for occasional therapy. Prosecution lawyers hoped on Tuesday to salvage two restrictions. They wanted Vinograd to decide that when she’s not at therapy she should continue to be under house arrest and subject to electronic tagging. But the judge was not interested in discussing an appeal, meaning that Leifer will live as a free woman. Shana Aaronson of Jewish Community Watch was “devastated for the victims and for the Israeli justice system”, when she talked to The AJN on Tuesday. “It’s very hard to wrap your head around,” she said. With Tuesday’s ruling, the door to extradition proceedings has been slammed shut – for at least six months, and in all likelihood, given the nature of Leifer’s health claims, for several years. Australian anti-abuse activist Manny Waks told The AJN that with Leifer free, he is worried for Israeli children. “There is no justice for the alleged victims and children in Israel are endangered,” he said. “If she is that unwell that she is unable to face court for an extradition hearing, surely she needs to be institutionalised,” Waks said. Talking to The AJN, Australia’s ambassador to Israel Dave Sharma said that he is not giving up on the extradition case. “We remain determined to see her extradited to Australia to see her face serious charges,” he said. Sharma has raised the issue through diplomatic channels and directly with Israel’s Justice Minister Ayelet Shaked. “We are in discussion with Israeli prosecutors about the next steps that we can take to pursue this extradition,” he stated. Leifer’s plans are unknown. She is now free to leave Bnei Brak, where she has been living under the conditions of her house arrest; and if she wishes, she can move back to the settlement of Immanuel where her family lives. The sole success for prosecutors was to keep Leifer’s passport in the hands of the state, but there are some fears within the justice establishment that there have been cases of people leaving Israel without a passport and she could still pose a flight risk. This is believed to be why the prosecution lawyers are keen to use the very last tool at their disposal: bail. Vinograd ruled the 100,000 shekel bail money should be returned to Leifer, but prosecutors want the state to retain the bail and possibly double it. The bail is the only issue on which prosecutors have the right to appeal, and as The AJN went to press they were making a decision on whether or not to use this right. ​Originally published at The Australian Jewish News.